While the temperature is cooling down our online hours is heating up, as we are pleased to commence our latest urban inspired fall design. This season we wanted to blend our strong African influences by infusing the colors of Rastafarians, the spirit of Fela Kuti, and our love affair with earth’s color. Afrobeat is a term coined by Nigerian born band leader Fela Kuti. Popularized during the 1960/70s, Afrobeat encompasses musical styles from various genres. Kuti used native African harmonies and rhythms combining different elements like jazz, funk, fusion, African chant and structured them. The rich sound echoed the political struggle not only by Africans but also by African-Americans during this period. Our aim for the Afrobeat concept was to encompass both the political struggle of blacks and the influence music plays in strain for survival. The bernos Afrobeat is available in Cranberry Red American Apparel Shirt for $19.95! Argyle pattern which consists of diamond shaped blocks against a colored background has its roots in Scotland as early as 16th century. Although the pattern has been used in fashion through the 19th century; the preppy look brought back the argyle with a vengeance in the 80′s and it’s been commercial every since. The Rasta Argyle concept is an establishment of ‘Rastafarnism’ in popular culture. Our design with bright Rastafarian colors of red, green, and yellow is juxtaposed within the Argyle pattern. The bernos Argyle Rasta is available in Heather Grey American Apparel Shirt for $22.95. Why refurbish and re-stock you might ask? The answer is simple…We got your blog comments, emails, text messages, and from some of you, your voicemail. We get it! You want d’afrique…you get d’afrique! We are re-launching the popular shirt with bigger font and more prominent graphic. Now you can claim your roots from miles away. As stated before, d’afrique represents our portrait of life in Africa layered with the rich detail of our struggle, celebration of our roots, and our hope for unity. The bernos d’afrique is available in Brown American Apparel Shirt for $19.95. Published by Meron November 11th, 2008	in African, Bernos and Design. the t-shirts look incredible… especially the colours in the afro beat shirt. going to buy one and keep in my closet until summer. btw. Great looking Ts guys. I’ll order the afrobeat soon. Shall I call Kulubiw for the re-launching of “I dream Be Amarigna”? 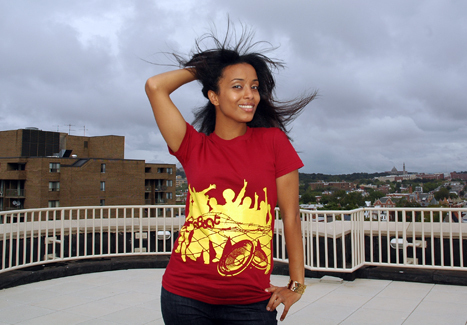 Nice Design, good prices considering you are using AA tees, I especially like the Afrobeat tees. I will defenetely buy a few… You guys are great keep it up. I must say I’m quite impressed with your designs! Creative, yet simple, yet trendy, yet stylish. Keep up the good work and I will purchase a few as Christmas gift. Question: If I buy a couple of your t-shirts online, I’m assuming using PayPal. Can you send the t-shirts on my behalf to family members in Europe or do you have to ship all the t-shirts to me? Thank you each and every one of you for the positive feedback!!! Once you’ve made your purchase using PayPal…send us an email @ info@bernos.org and let us know to whom you want us to send the t-shirts and we will send the gift directly on your behalf. oh my my! I better hurry up and get me some of these. Wuz up Bernosawian? I’m proud of you all as always. Wow, is all I can say . . .
Great designs, models, the whole nine . . .
As a social entrepreneur working to positively impact my people and planet through the better education of our children, I’d love to discuss ways we could collaborate for a greater good . . . Check out my products and programs at http://www.uniteedesign.com, and let me know if you’d like to grow something power and special . . .
For all our children truly need is all of us . . .
where may i purchase the D’afrique and afro beat tshirts? I’m a teenager and I heard that you can actually get paid for things like this. I’m experienced with computers and have good literature skills and I’m sure I can write successful blogs / articles .. . On a different (sort of) topic, I would like to be able to join affiliate programs?. who have a hard time in their life with weight. We started a drive early in the morning one cold winter day. Great – I should definitely pronounce, impressed with your web site. I had no trouble navigating through all the tabs as well as related information ended up being truly simple to do to access. I recently found what I hoped for before you know it in the least. Reasonably unusual. Is likely to appreciate it for those who add forums or anything, site theme . a tones way for your client to communicate. Nice task. Great – I should certainly pronounce, impressed with your website. I had no trouble navigating through all the tabs as well as related info ended up being truly easy to do to access. I recently found what I hoped for before you know it at all. Reasonably unusual. Is likely to appreciate it for those who add forums or anything, website theme . a tones way for your customer to communicate. Nice task. You are my aspiration , I possess few web logs and infrequently run out from to brand.I think this website has got some very great info for everyone. “A man’s dreams are an index to his greatness.” by Zadok Rabinwitz. It is really a nice and useful piece of information. I am happy that you just shared this useful information with us. Please keep us up to date like this. Thank you for sharing. Some genuinely superb blog posts on this website, regards for contribution. “Such evil deeds could religion prompt.” by Lucretius. Its fantastic as your other articles : D, regards for putting up. “A lost battle is a battle one thinks one has lost.” by Ferdinand Foch. You can certainly see your expertise in the work you write. The sector hopes for more passionate writers like you who are not afraid to say how they believe. At all times follow your heart. “Until you’ve lost your reputation, you never realize what a burden it was.” by Margaret Mitchell. magnificent points altogether, you just received a brand new reader. What could you recommend about your put up that you just made a few days in the past? Any positive? hello!,I like your writing so a lot! proportion we communicate more approximately your article on AOL? I require an expert in this area to solve my problem. May be that is you! Looking forward to see you. It’s truly a great and helpful piece of information. I am happy that you simply shared this useful info with us. Please stay us up to date like this. Thanks for sharing. I must express my appreciation to this writer just for rescuing me from this type of dilemma. Right after looking out through the the net and finding views that were not pleasant, I thought my entire life was gone. Existing devoid of the answers to the difficulties you have fixed through the posting is a critical case, as well as the kind that might have badly affected my career if I had not come across your web site. Your good skills and kindness in maneuvering every item was useful. I don’t know what I would have done if I hadn’t come across such a thing like this. I can also at this point relish my future. Thank you so much for your reliable and amazing guide. I will not be reluctant to endorse the website to any person who would need guide about this matter. 45 ???????? ?? ?????????? ??????????? ? ??????? ?? ????? Thanks for sharing excellent informations. Your site is so cool. I am impressed by the details that you’ve on this web site. It reveals how nicely you perceive this subject. Bookmarked this website page, will come back for extra articles. You, my friend, ROCK! I found simply the information I already searched all over the place and simply could not come across. What a great web-site. I simply wanted to write down a brief remark in order to say thanks to you for all of the amazing secrets you are giving on this website. My time intensive internet lookup has finally been recognized with brilliant suggestions to share with my colleagues. I would declare that most of us readers are truly endowed to live in a superb website with many awesome individuals with good guidelines. I feel pretty fortunate to have used your entire weblog and look forward to really more fabulous times reading here. Thanks a lot once more for all the details. Really useful info. Well this is weird, when I opened my computer your page was running. We choose our joys and griefs long before we experience them. I am actually happy to read this webpage posts which consists of tons of helpful data, thanks for providing these data. If you have the time, write me an Email and we can discuss, I have an idea you will like. I like your post however… I am dyslexic. Do you have videos on the topic? I would like to read a lot more of these blogs but I literally have no cell phone reception where I am right now. You really need to write a lot more content if you want to become an leader in this industry. I’ve tried a few of them and I really can not decide which one I like the most. Exceptionally well written article!